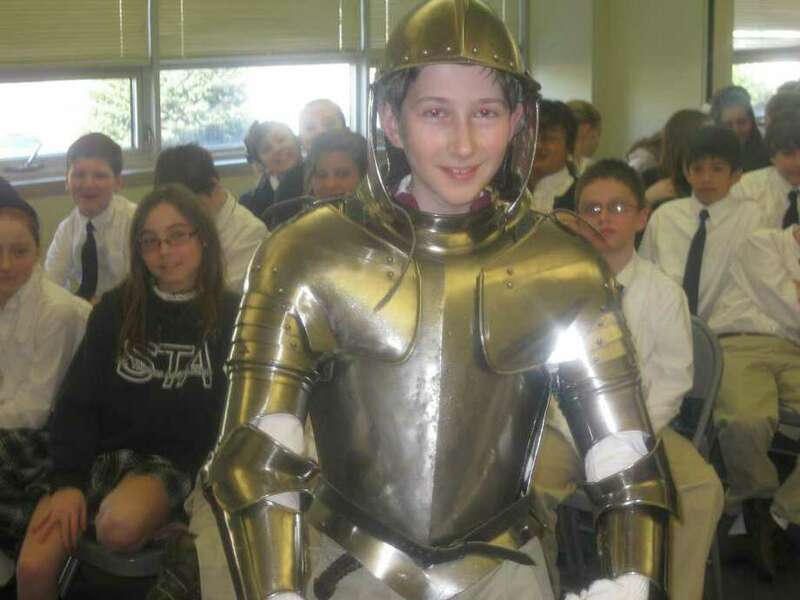 St. Thomas Aquinas School student Ryan Cimmino got to try on a suit of armor during a recent program on the Medieval ages at the school. Oh what a Knight students at St. Thomas Aquinas School had one recent day. That's the result of a visit by a representative from the Higgins Armor Museum in Worcester, Mass., which houses the largest collection of Medieval armor/weapons in the Western Hemisphere. Neal Bourbeau, a historian with the museum, shared with St. Thomas middle school students his knowledge about the Medieval ages, including the evolution of armor and weapons from Medieval through Shakespearean times. The students even got to try on a suit or two of the shiny armor plate.